Welcome to part two of my hidden history walk around Spitalfields and Whitechapel - just in time for the weekend if you're thinking of doing some exploring around the capital! If you missed part one why not check that out first - you can find it here. The sights and sounds of Fashion Street. At the end of part one we had just stopped by the Ten Bells pub for a quick half and a little leg rest. After our refreshing stop and my spooky trip down to the basement toilets we headed out into the open again and had a wander around Fashion Street. Built in the 17th century by the Fossan brothers (hence the name) it is notable for the Moorish architecture on the south side that was originally intended to be an arcade of retail outlets. Unfortunately the scheme failed and the unusual building was turned into a number of business locations that still occupy the space today. After a number of other interesting spots along the way (interesting but maybe not so photogenic and I need to narrow down the over 250 pictures that I took to make this bearable for you the reader!) we found ourselves on the famous Brick Lane. I had been to Brick Lane a number of times before but had never really had my eyes open to the immense history and tales hidden within the walls of this street. Including the brilliant Beigel Shop at number 155 - the oldest in London founded in 1855 and reportedly the best! We also passed the Jamme Masjid Mosque which is notably the only location in the country to have been used as a place of worship by Christians (French and English), Jews and Muslims throughout its history. Find out a little bit more about it here. The area of Puma Court, Princelet Street, Fashion Street (as mentioned above), Fournier Street and Wilkes Street is probably one of the quaintest and picturesque in the area. With beautiful housing dating largely back to the 18th and 19th centuries that were mostly occupied by the Huguenots who had fled to the UK from France. You feel like you're stepping back in time as you wander around these streets and stare upwards at the beauty of the buildings and their wonderful details and features. On Fournier Street at number 37 look upwards and you will see an original fire protection badge still in place. These were commonplace in the 18th century before the country had a national fire service. Back then you would pay a premium to an insurance company in order to ensure fire protection from their private fire fighting services. The badges were proof of your policy and without one you wouldn't be protected in the event of a fire. Not only that but if a crew turned up and you were insured by a rival company then they wouldn't fight the fire for you either! I've mixed the pictures up a little bit in the above collage but this demonstrates the remaining shop signs from local business in the area - a little reminder of the locations rich history. CH N. Katz at number 92 on Brick Lane was a Jewish owned business that until only a few years ago sold string and paper bags. S. Schwartz at number 33 on Fournier street is another such reminder of the areas Jewish history where the shop sign of a business now long gone still endures. After exploring the little adjoining streets and their secret wonders we found ourselves back on Brick Lane heading towards the old Truman Brewery complex. It's original name was the Black Eagle Brewery and it commanded around 11 acres of the Brick Lane area. It was in the 1660's that it came under the ownership of Joseph Truman. Production ceased here in 1988 after a decline in the popularity of its beer. The spot is now rented by local businesses, architects and artists. Another notable sight as you walk around this area is the abundance of street art and really pretty stunning graffiti. Now say what you might about graffiti and I would wholeheartedly agree that just mindless tagging and vandalism is not a good thing. Yet these murals and images are on another level, artistic and I think really beautiful. They certainly make you stop and stare, just the size and detail of some of them is really quite impressive. Once we had finished a full exploration of the Brick Lane area and all it had on offer we wandered back on ourselves and headed toward Whitechapel Road. Here we passed the Old Royal London Hospital where the plaque above resides and where hidden in the crypt of its former church you will find a small museum housing exhibits on nursing and dentistry as well as history of the lives of Edith Cavell and Joseph Merrick - also known as the Elephant Man. The tale of Merricks life, pain and treatment is a sad one but was made more comfortable by Sir Frederick Treves a surgeon at the hospital who intervened allowing Merrick to live out the remainder of his short years under his care. There is a copy of Josephs skeleton on display in the museum - the original is also preserved here but is not on public display. You can also find exhibits on Jack the Ripper, Dr Crippen and the Christie murders (should you feel in such a mood!) in the forensic medicine section. Continuing down Whitechapel Road you will come across the Blind Beggar pub. Notorious for being the location where, in 1966, gangland boss Ronnie Kray shot and killed George Cornell. The murder for which he was convicted and imprisoned for in 1969. Cornell had been a friend of the Krays who had left them to work for their rivals the Richardsons. 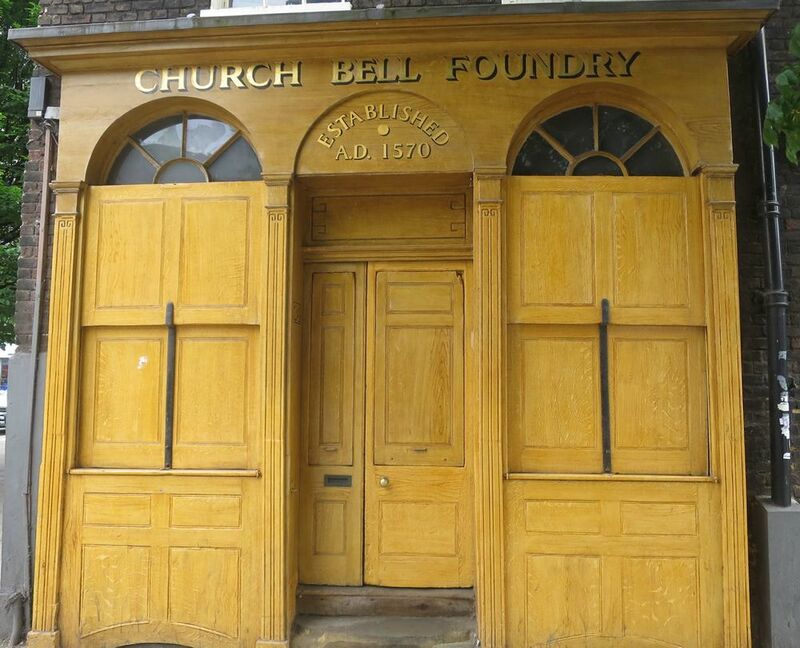 Feeling tired and near the end of our ability to walk much further for one day we turned back on ourselves in order to seek out the Whitechapel Bell Foundry. This tiny shop front and inconspicuous looking location is actually the oldest manufacturing company in the country and the site where Big Ben was made in 1858 a nice little stop to make and take a photo of such a great piece of history. All of the walking was calling for a cake and cup of tea break before making our way back home. We made our way towards Aldgate and stopped for said tea and cake before taking a quick look around the Whitechapel Gallery. This free gallery has over the years premiered world-class artists from modern masters such as Pablo Picasso, Jackson Pollock and Frida Kahlo and is a great spot for hunting out contemporary art exhibitions from both local and international artists. Alas so with tired feet, a camera bursting full of pictures and a mind reeling with new facts and inspiration we slowly made our way back to Liverpool Street Station, our starting point and the best route to take home. What a great walk - we didn't get to all of the spots suggested in the book but we covered and learnt so much that it was well worth the visit. If you're in London do consider taking a trip to this part of town. It has so much to see, is unique, lively and bustling and really well worth your time checking out in a little more detail. I'm now thinking of where to explore next in London so if you have any suggestions be sure to drop me a note in the comments section. Have a great weekend everyone and I'll be back soon!